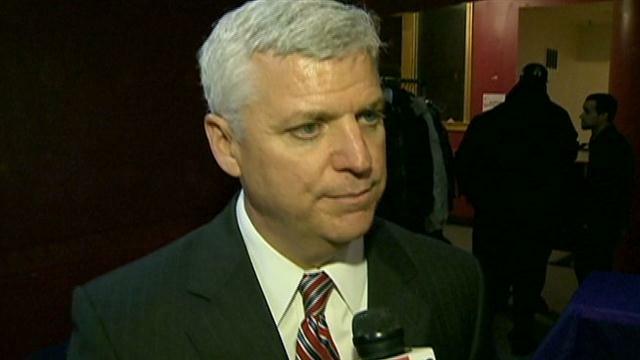 BOSTON MAYOR RACE : DAN CONLEY FOR ATTORNEY GENERAL ? ^ Dan Conley : more a law officer than a Mayor ? Question : has any Suffolk County District Attorney ever been elected Boston’s mayor ? This writer can’t think of one. Perhaps this is why rumors abound that Dan Conley, the current “DA,” will leave the Mayor race to seek the office of Massachusetts Attorney General instead. Supposedly all that Conley is waiting for is current “AG” Martha Coakley announcing her candidacy for Governor – a decision that all observers expect. If true, the move by Conley makes sense. He has amassed barrels of money – at last report his account had well over $ 1,000,000 on hand – and proposed a bold agenda, yet still lags in recent polls that show him running third to Marty Walsh and John Connolly. It is Connolly and Walsh who have won the past week’s major endorsements; Conley was passed by. The murder of Amy Lord and the pending indictments of Aaron Hernandez have brought enormous publicity to Dan Conley. Yet none of it has helped his Mayoral hopes. If anything, the publicity has actually hurt Conley. Crime and prosecution are certainly big matters to voters; but they are not matters that people identify with being Mayor. The issues that voters ascribe to their Mayor are these : zoning; schools; development; civil rights; and, most sweeping of all, quality of life – in the neighborhoods, with street cleaning and snow removal as well as road repair, and Downtown, moving it to a closing hour more progressive than the current 2 A.M. absurdity. Conley, as District Attorney, deals with hardly any of this. Were Conley to leave the mayor race, who would benefit most of the 9 % of voters that current polls give him ? Nine percent of the likely Primary vote totals about 14,000 votes. Obviously the 14,000 will not go only to one Mayoral contender. That said, as we see it, the largest block of this 14,000 will go to the remaining “traditional” candidates. And not just any of them; the most significant benefits will surely go to Councillor-at-Large John Connolly and State Representative Marty Walsh, and not to District 5’s City Councillor, Rob Consalvo. ^ Rob Consalvo : being squeezed out ? Conley lives in Ward 20. So does John Connolly. Connolly is polling in first p[lace. As voters like to pick winners rather than give up a vote on someone who won’t likely win, Connolly is sure to pick up most of the “local guy” vote that Conley is now drawing. 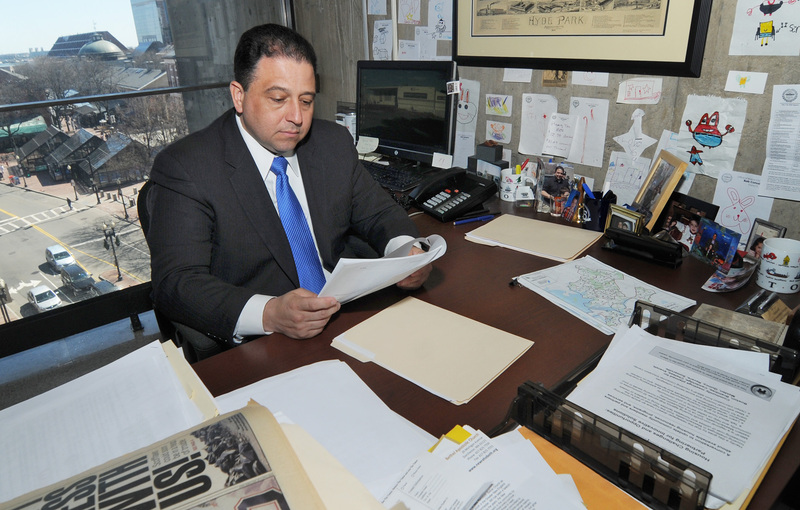 Consalvo, too, has strong support in Ward 20; but he has failed to win recent endorsements, indeed was passed on by St. Rep. Carlo Basile of East Boston. If Consalvo can’tr win the support of an Italian-name legislator, who can he win that he does not already have ? He will pick up some Conley votes, yes; but not nearly enough. But that’s not the whole story. Conley has paid much attention for months now to South Boston. 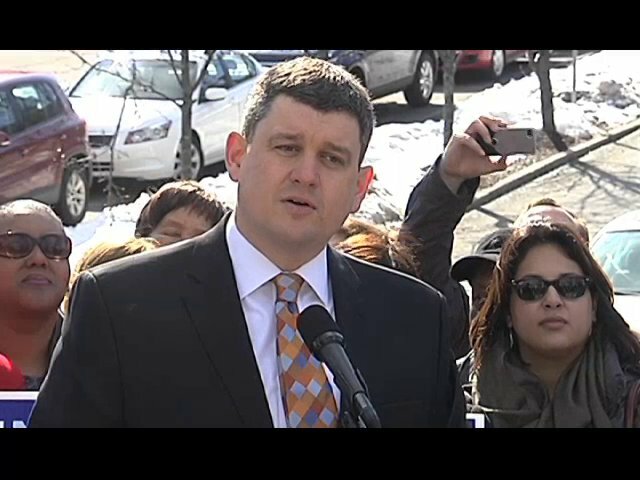 He campaigned there on April lst, when that neighborhood (and Dorchester) chose a new State Senator. (Here and Sphere photographed him that day campaigning among voters at Gate of Heaven parish hall, where two South Boston precincts voted.) South Boston is still home to large numbers of city and county employees; and Conley’s Irish name surely still draws many votes in the City’s archetypal Irish-name neighborhood (though that is changing, as we all know). ^ Dan Conley campaigning at Gate of Heaven parish hall on April lst. 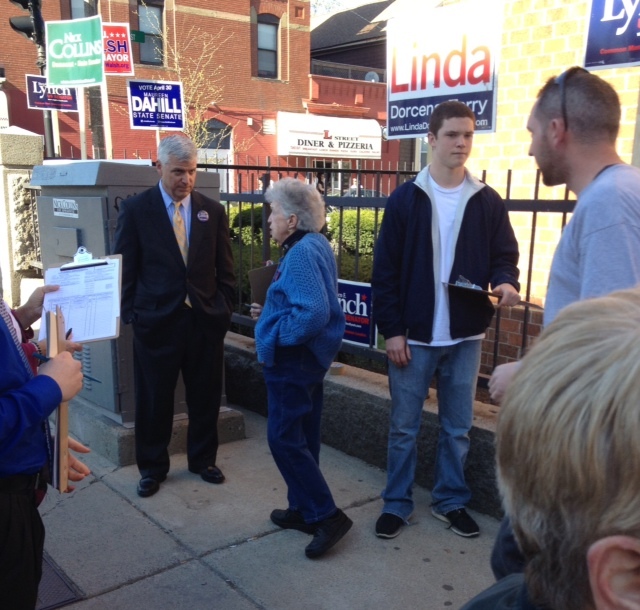 In Southie, the winner of most Conley votes would likely be Marty Walsh, not John Connolly. 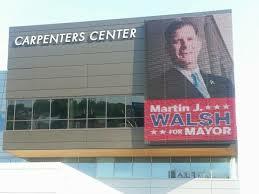 Walsh lives in Savin Hill, the Dorchester neighborhood closest to “Southie” culturally and proximately. Like Connolly, Walsh, looks a winner. He polls a close second to Connolly and has significant support from Labor Unions both public and private – groups strongly represented in the South Boston’s vote. For some time now, the September primary for this year’s Mayor race has looked like a Walsh and Connolly “final.” Dan Conley leaving it to run for Attorney General makes this Primary result almost a certainty. It WILL Be a certainty if the many “new Boston” candidates now dividing about 25 % of the likely Primary vote don’t stop chasing their own individual dreams, none of which can come true if all keep on chasing. The “new Boston” vote can command the Primary and win the “final.” But it can’t do anything if it continues on its current eight-candidate course. Dan Conley’s momentous decision awaits. 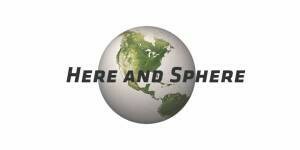 Previous PostOBAMA-CARE IS HERE TO STAY, AND IT’S GOOD FOR THE ECONOMYNext PostLOOKING FOR A JOB, ARE YOU ? PLEASE — NO RESUMES !